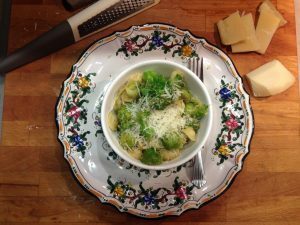 The secret ingredient in this recipe is the chopped peperoncino (spicy peppers) which warms up your mouth leaving the space for grated pecorino (or Parmesan cheese) to melt and add saltiness as a final touch. 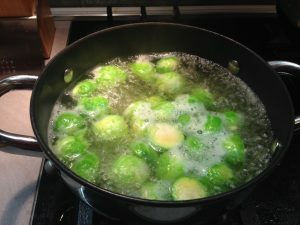 Clean and cut in half Brussels sprouts and cook them in abundant salted water for about 10 minutes. Remove them and drain them with a paper towel from excess water. 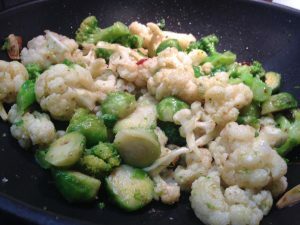 Cook separately first cauliflower than broccoli for about 4 minutes each and place them on a paper towel to absorb the water. Keep the water you cooked your vegetables in as you will use it for pasta. (that will give pasta some extra flavor). Add pasta immediately to boiling water (it will cook for about 9 minutes while you will prepare sauce). 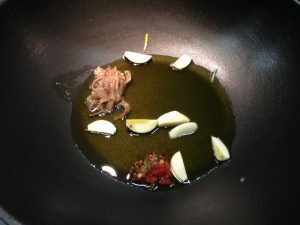 Place the garlic and peperoncino peppers in the large pan and over low heat slowly brown the garlic. 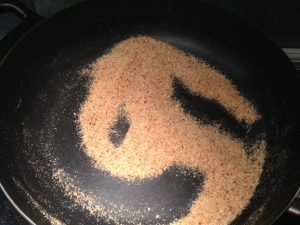 Place the bread crumbs in the non-sticky pan without oil and toast them mixing constantly until you get nice golden color (my first batch burned because I was looking for a song on youtube and I had to do it again). Add vegetables to your pan and mix it delicately for about a minute and let the flavored oil cover all. 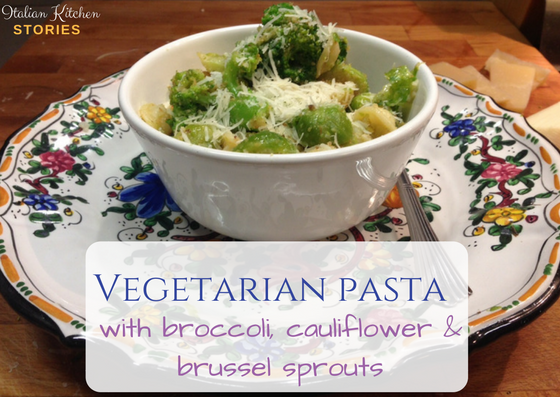 Add pasta to vegetables and on top of them add a mix of bread crumbs combines with grated cheese. Mix gently all ingredients and serve immediately. Decorate each plate with grated cheese.